Hollywood couldn’t have scripted it any better - back in March, rookie Trey Canard won his first ever Supercross Lites race in Atlanta. It was no fluke, as the youngster won his first three on the trot and did a great job maintaining his advantage ahead of Pro Circuit’s Ryan Villopoto, until last week. Stranded with a motorcycle that didn’t want to start, Canard remounted and took tenth in Detroit, but his lead was down to a slender three points heading into the final round. With Villopoto back on form, no-one gave Trey Canard a chance; it was almost impossible to imagine him beating Villopoto straight up or finishing close enough to take the crown. But when it came to the crunch, Trey held his nerve - and it was Villopoto who blinked first. Canard holeshot the main, but Villopoto’s Pro Circuit team mate Brandon Jesseman snuck right by him for the lead. Canard’s team mate Josh Grant briefly made it into second before Canard got going, retaking both Grant and Jesseman as Villopoto closed up and joined in the fun. RV made his way past the lot of them to take the lead, leaving Trey in a Kawasaki sandwich and, as Villopoto began to build an ominous lead, it looked like it was all over for Canard. But the youngster raised his game, lifting his pace and actually closing in on arguably the fastest 250f racer on earth. As the race approached the halfway point, Canard was within range to try a pass. 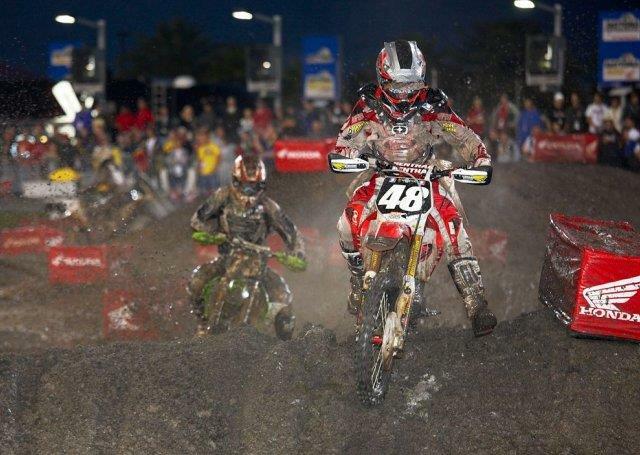 Canard made a move on the ‘07 West Coast champion, but the two collided before the finish line jump. Canard stayed on course, but Villopoto got pushed wide and found himself running into the finish line gantry. For Canard, that moment meant he had to just bring it home. And whilst Villopoto could only remount for fourth, Grant took third and Jesseman an excellent second, but Canard took the win and the title in his first season with a brilliant ride under intense pressure. A first title - but not, I suspect, his last. In the Supercross class, San Manuel rider and championship leader Chad Reed was still in serious pain after breaking his shoulder in a horrific practice crash last week. The Aussie stayed off the motorcycle all week and partook only a limited programme on race day in order to spare himself as much pain and damage as possible. It paid off with a fast start and he led Torco Fuels Honda’s Kevin Windham in the main event, but he was definitely feeling the effects. Windham applied the pressure straight away, then made a move through the whoops on lap four and cleared off for the win. Reed, just as tough as they come, hung on to take second place ahead of Andrew Short, which means Chad heads Kevin by 13 points with just two races left. This one really could go either way.